• IS NOT Orthodox Christianity – an institution or organization • IS – a Living Organism –the people of God –As the people of God we: • Gather together in his name • Share a common faith in love of God • Affirm truth & fullness of their faith belief & experience • Proclaim the Good News of Christ in word and deed An Orthodox Christian… is a person who lives according to the image of Jesus Christ and affirms the fullness of truth He reveals. Ortho dox Christ ian True or correct complete doctrine Belief teaching doctrine Jesus Christ in whom our faith is rooted One who strives to live as Christ did Origins • Traces its origins to Jesus Christ and the apostles • Born on day of Pentecost – 50 days after Christ’s resurrection when the Holy Spirit descended upon the Apostles – Apostles went throughout the world proclaiming the Good News of the Risen Christ to all who would listen • Subsequently spread to every corner of the world • Planted in North America by Orthodox missionaries – Alaska, 1794 • Orthodox Church Today Throughout the world – 300,000,000 Orthodox Christians • In North America – 2,000,000 Orthodox Christians – 2800 parishes, missions institutions and monasteries • The Church continues to invite people to – Come and see the fullness of the faith – Embrace it as their own Orthodox Christians Attempt to Serve God by: - Worship - Fellowship - Discipleship - Stewardship Orthodox Christianity: What We Believe Holy Scripture • Old Testament – Records the manner in which God prepared the world for the coming of His Son, Jesus Christ. • New Testament – Completes and fulfills God’s revelation… – by proclaiming Jesus Christ as Lord, God and Savior; – as the very Word of God – Who came to live in the midst of His people; – and as the perfect, final and complete revelation of God to the world Holy Tradition • Is… – the ongoing life of God’s People – that which God’s People have believed, lived, experienced, celebrated and shared at all times and in all places. – the living link that unites God’s people in a common faith, life & experience. • Includes… – all that is essential to God’s revelation and necessary for our salvation Holy Trinity The one God is three separate and distinct Persons Father, Son and Holy Spirit • Each Person of the Trinity… – Shares fully and equally in the divine nature and will AND – Is infinite, perfect, all knowing, ever existing and eternally the same AND – Is perfectly united to the other Persons of the Trinity in love. Salvation • The process by which we prepare to enjoy eternal life with God. • Ends our separation from God, enabling us to begin a new life in accordance with His will. If you are from a Protestant or non-liturgical tradition, you may feel overwhelmed the minute you walk in the door of an Orthodox Church. You will find yourself surrounded by a blaze of color in the priests’ vestments and the icons that adorn the walls. The pungent odor of incense will assault your nose. Rich, deeply moving but unfamiliar music will fill your ears. All around you people will be doing things – lighting candles, kissing icons, making the sign of the cross, bowing, standing in prayer-everything but sitting still. To someone accustomed to four bare walls and a pulpit, all this may seem pretty strange. Everything we see, hear smell, touch, taste, or do in the Orthodox Church has one purpose: to lead us closer to God. Since God created us with physical bodies and senses to grow closer to Him. Iconography - We read in the Epistle to the Hebrews (12:1-4) that we are surrounded by a great cloud of witnesses who watch after us and urge us on in our race toward Christ. We believe that the saints who have already run their race on earth indeed surround us - as in a stadium, the crowd surrounds the runners in the Olympics. In our homes, as well as in our churches, Orthodox Christians image this reality out by the placement of icons. Why Do People Kiss Icons When They Enter And Depart From the Church? It is our belief that human beings have a deep God-given need to express what we feel inside when those feelings are pure and good. Orthodox Christians have great devotion and love for the individuals depicted in many of our icons. "Greet one another with a kiss of love," 1 Peter 5:14. When Roman Catholics or Protestants "pass the peace," they give a hug, handshake, or peck on the cheek. In Orthodoxy different cultures are at play: Greeks and Arabs kiss on two cheeks, and Slavs come back again for a third. There is also a vast distinction between honor (i.e., veneration or respect) and worship. We worship God alone, and may have no others before Him (Exodus 20). The Orthodox Church has already dealt with the issue of those who could not make that distinction (i.e., the "iconoclasts") in the 8th century 7th Ecumenical Council. The priest faces in the same direction as the people, because he leads his spiritual flock towards God; if the priest were facing the people, it would imply that he was the center of attention, when God is supposed to be. Why are there so many candles? The faithful light candles as a sign of their fervent prayer to God. We light candles and lamps before icons; we carry them in processions; we place them at various locations throughout the church building - simply to give off illumination. The more candles that are lighted, the more light is generated, and greater is the image of the Empty Tomb of the Lord which shone forth with a brilliance far greater than the light of day. Why are Priests called Father in the Church? This is not what the Bible teaches! Doesn't Jesus Himself say, 'Call no man on earth your father, for you have one Father who is in heaven.' (Matthew 23:9). This question presupposes that this passage of Scripture should be taken literally as an absolute prohibition. Is this what Christ is saying? Why do the clergy & altar servers wear such unusual clothing? These garments are called vestments. Rooted in Old Testament worship, vestments manifest God’s grace given to those who hold priestly office or serve in the altar. Why are the epistle readings and gospel readings chanted? This practice continues from the OT synagogue tradition. Advantages: memorization, projects voice farther, & permits the reader to emphasize certain words to enhance meaning. Why does the priest say, “the doors, the doors” during the Liturgy? In the early church, non-Christians and catechumens were excused at this point and the church doors were closed. Only baptized Christians were permitted to participate in the “Liturgy of the Faithful that followed. With our fingers in this position, we touch our forehead, for the blessing of our mind, our stomach, for the blessing of our internal feelings, then our right and left shoulders, for the blessing of our bodily strength. Did you know that the proper way to greet a priest or bishop is to kiss his right hand? How do you do this? Approach the priest with your right hand over your left hand and say “Father bless.”He will make the sign of the cross, and place his right hand over yours. This is much more appropriate (and traditional) than shaking their hands. After all, the priest and bishop are not just “one of the boys.” When you kiss their hands, you show respect for their office — they are the ones who “bless and sanctify” you and who offer the holy gifts on your behalf. So next time you greet your priest don’t shake his hand, ask for his blessing. • Antidoron: This is frequently given to visitors & parishioners as a gift out of love. 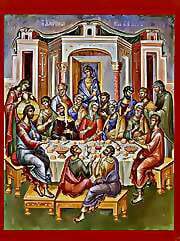 The bread is blessed and set apart before communion and should be eaten reverently. • Theotokos: Theotokos (Mother of God) is a title for the Virgin Mary. Orthodox love and honor (but do not worship) her because of our union with her Son. • When we sing "Holy Theotokos, save us," we don't mean that she grants us eternal salvation, but that we seek her prayers for our protection and growth in faith. • Presvetera: When you address the priest’s wife, you always address her as Presvetera. • Why? Out of respect and because she holds a special role as parish mother. • The church building has many symbolic meanings; perhaps the oldest and most prominent is the concept that the Church is the Ark of Salvation (as in Noah's Ark) in which the world is saved from the flood of temptations. Because of this, most Orthodox Churches are rectangular in design. Another popular shape, especially for churches with large choirs is cruciform or cross-shaped. • The Narthex (from the Greek word for "porch") is the antechamber to the nave of the church and originally functioned as that part of the building where the catechumens (persons receiving Catechesis, or instruction) were taught the faith in preparation for becoming Christians. • Today the narthex is a place where votive candles are lit, where icons of Christ and other sacred image can be venerated, and where one can achieve a solemn and spiritual mood prior to entry into the church itself. Even to this day, the narthex is the setting for the initial part of the baptismal service, when one is brought into the faith as a new Christian member. • The Nave, or church proper, is where the people sit or stand. Within the nave are found the bishop's throne, the pulpit, the baptismal font, the soleas, and the pews. • The Soleas, or that elevated portion of the nave just in front of the iconostasis stretching from the pulpit to the bishop's throne, is where the clergymen and chanters stand at various times to perform weddings, baptisms, funeral, memorial services, and doxologies. • The iconostasis is a divider that is highly decorated with icons and separates the sanctuary from the nave of Orthodox churches. Originally, a low rail embellished with Christian symbols provided this division, but in the 14th century the divider was raised and became today's iconostasis, thus completely separating the sanctuary from the congregation. Part of the iconostasis consists of three doors that allow entry into the sanctuary. • The larger, middle one is called the Royal Door, behind which that altar is situated. The door to the right is called the Deacon's door; and the one to the left, the Sexton's Door. The Royal Door can be closed by a gate or screen symbolizing the curtain of Solomon's Temple, which concealed the Holy of Holies The gate also reminds us of the dealing and guarding of the Tomb of Christ. • Only four icons are placed on the iconostasis in a prescribed order. The icon of Christ is always the first on to the right of the Royal Door as one faces the altar from the nave. Next to it is placed the icon of St. John the Baptist. And to the left of the Royal Door, one sees the icon of the Mother of God, next to which is the icon of the saint in whose honor the church is dedicated. • Other icons follow in no specific order, apart from those on the two side doors where the archangels Michael and Gabriel are depicted. Frequently above the iconostasis, a row of similar icons portraying the twelve great feasts of the Orthodox year are displayed. Above the Royal Door, the icon of the Last Supper appears. • The Sanctuary, representing the heavens, is an elevated area above the soleas, which is considered sacred because it is the place where the Divine Liturgy is performed. At the center of the Sanctuary stand the Holy Table or Altar, upon which the Holy Eucharist is consecrated. Within the altar are deposited the relics of a saint at the time of the consecration of the church by a bishop. • On the ceiling of the dome above the center of the nave is found the principal icon in the church, called the Pantocrator, or Ruler of the Universe. It is the icon of Christ holding the New Testament that tells the story of His life and teachings. Below the icon of Christ are frequently painted the Old Testament prophets of Israel, who wrote about the coming of Christ on earth. • Elsewhere on the walls of the church, one sees renditions of saints and martyrs as well as visual portrayals of the events of the life of Christ and diverse scenes of an ecclesiastical or historical nature. • Painted on the wall of the center apse is the important and frequently imposing icon of the Theotokos enthroned with the infant Jesus in her arms. It is called the Platytera, a term taken from the Liturgy of St. Basil in the sentence "...for He made thy womb a throne, more spacious than the Heavens that embrace mankind."